Bio Sol Portocarrero, a horticultural company focused on organic production in the Níjar Region, will be present this year at the Salón de Gourmets to be held in Madrid from 24 to 27 April through its Bioterraneo brand, to Fourth and Fifth range. Salon de Gourmets is a fair that every year brings together thousands of companies and professionals in the catering sector, which makes it an ideal setting to generate business opportunities and take the pulse of the sector, and that could not miss this company Dedicated to the production of fruit and vegetables. Thus, Bioterráneo will bring to all present its range of Gourmet products composed by Gazpacho, Salmorejo and Tomato Cherry Juice, and its range of products Selection of which oil and wine are part. A wide selection of products that stand out for being totally ecological, for their high quality, flavor and nutritional characteristics, that Bioterrane will show thousands of people through its booth, located in Pavilion 8 of IFEMA. In this sense, the products of this organic fruit and vegetable company enjoy an optimal quality thanks to the fact that Bio Sol Portocarrero is made up of people committed to the philosophy of organic farming promoted by the company. A differential seal that Bio Sol Portocarrero has created thanks to the perfect combination of respectful and careful practices with the environment, the preservation of natural resources and a production that is collected under natural processes, making exclusive and exclusive products that visitors of Salón de Gourmets will be able to find out personally next month. 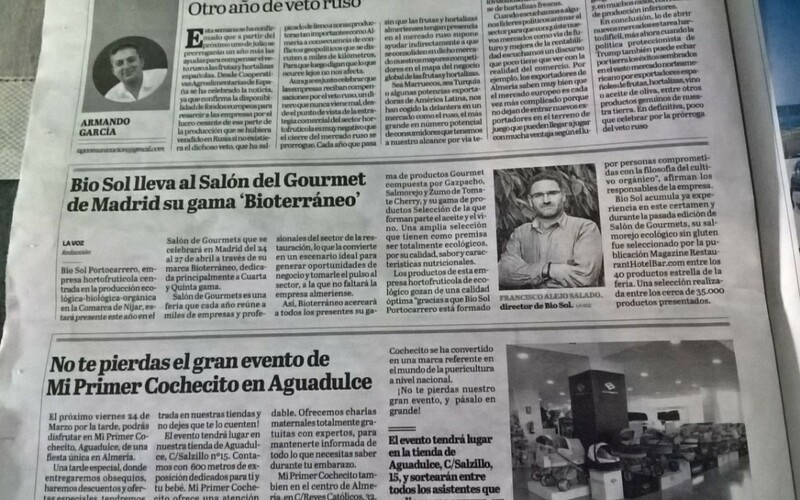 In this line, during the last edition of Salon de Gourmets, the organic salmorejo without Gluten Bioterrane was selected by the magazine Magazine RestaurantHotelBar.com among the 40 star products of the fair. A selection made among the nearly 35,000 products of the largest representatives of high gastronomy and the most unique foods. Likewise, the Journal of Gastronomy highlighted it among the 30 most innovative products of the 2016 edition. And is that the Hall of Gourmets is the largest European event dedicated exclusively to delicatessen products, the most innovative and avant-garde of the world’s gastronomy, which meet in this space, where producers can introduce consumers to the latest Of the sector. In fact, with more than 1,500 exhibitors showing around 37,000 products, the Gourmets Hall is one of the most prestigious quality food and beverage trade shows in the international scene today. Not in vain, it is an event capable of bringing together 85,000 people, just as it did in its last edition.